The budget was around $400,000. Big money, but not that big when the plan is to build a complete car from scratch. 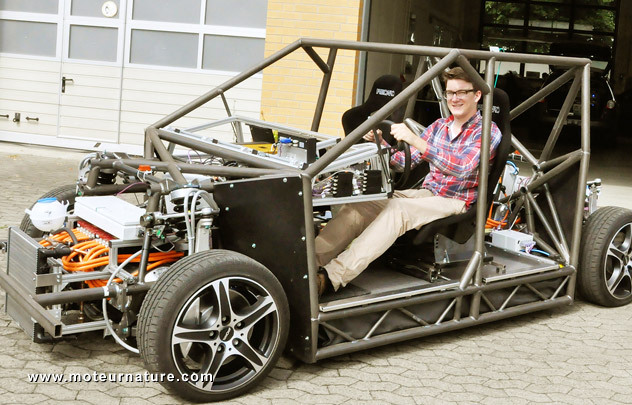 Especially when the car has four wheel steering, an electric propulsion with four motors (one per wheel) and lithium ion cells to power them all on an original frame. Well, everything is original in that car! It may not look good since no money was spent on design, but it’s very fast with four 110 kW motors (600 hp total). Yet it wasn’t built for speed, this prototype was built for control. Electronic controls, they’re all over the car. Like for steering. There is a steering wheel, but there isn’t anything mechanical between it and the wheels. Same thing for the accelerator or the brake. It works so good that it could be possible for the driver not to be in the car. He would drive remotely, from his home computer.